You can learn more about my artistic process on Skillshare.com! 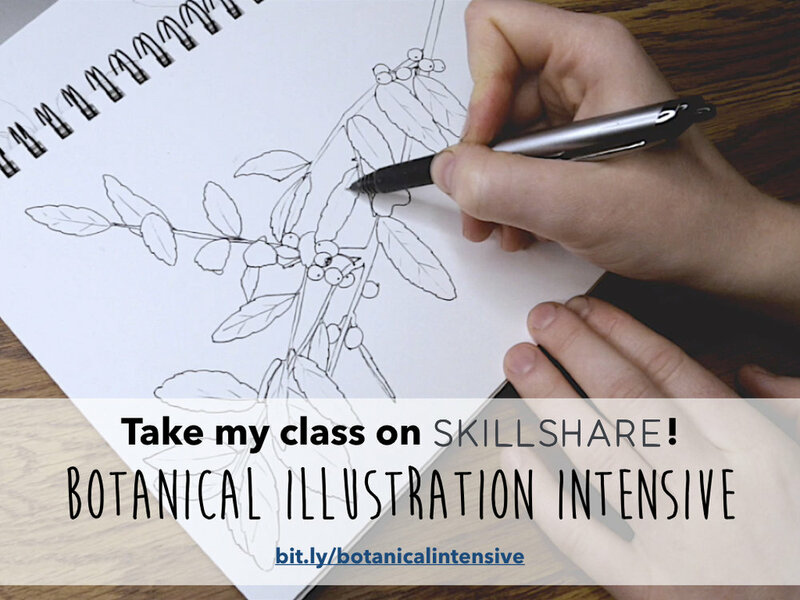 Join me in this Botanical Illustration Intensive, and learn to create science-based and artistic botanical illustrations of plants found around you everyday. Do you want to combine your art with your love for nature? If so, this class is for you! Learn to draw realistic plants like a botanist would and use your own artistic style to create one-of-a-kind botanical illustrations. This class is perfect for illustration newbies, plant-lovers, and long-time artists who want to add a scientific touch to their botanical illustrations. Together, we will get outside, look at plants, and photograph them to use later as references for your drawings. We'll then work together to create a realistic, botanical line drawing and an expressive, stylistic botanical illustration using your unique drawing style. You'll come away with the confidence to create your own illustrations of the plants around you everyday.